Late comments about the VK9NA expedition I joined in January 2011. This was a VHF/UHF/microwave and 2m EME operation. Due to quite poor conditions for tropo across to the mainland, we eventually did most of the operation on 2m EME. However we did try to make contacts and ran a lot of CQs on 144 MHz every day. We did make some contacts but there were nowhere near the number of tropo contacts made last year. The 144 MHz band was the main band used for this work. We activated the station every day on 6m as well, from the hotel site. Due to the high winds experienced on the hill we moved the EME station to the Guide Hall where we had been kindly offered the use of the grounds. On Norfolk the internet access is provided by Wifi connections at hotels/resorts and a few in the Burnt Pine business area. I found it was necessary to buy several different cards to get access via NIDS, Norfolk telecom and another account for access at the hotel I stayed at. Wifi access from Mt Pitt was good, from the hotel the others stayed at, access to NIDS was not good. The radio conditions on vhf up were not as good as they had been in 2010. This was partly due to physical weather conditions, including strong winds for the duration of the operation from 8th to 20th January. On the weekend of the summer field day conditions were very poor and the only contacts made with the mainland that weekend were on 6m, and there were not many of them. The 2m EME operation was very successful. Over a hundred contacts were made using JT65 via the FT897 and a laptop computer running the WSJT software. A TE systems amplifier boosted the output power of the FT897 for EME work. The list of stations worked is at the VK9NA website. I greatly enjoyed the event. 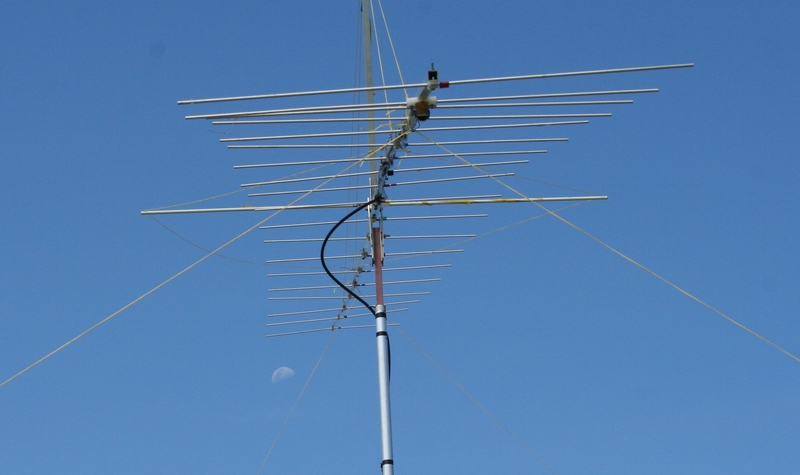 I learned how to use WSJT on both FSK441 and JT65B, and learned a bit about pointing a very large 2m antenna (19 elements, 12 metres length) at the moon and periodically repointing it. For about half or more of the time, the moon was not visible so we were relying on compass bearings corrected for mag offset/declination and an inclinometer for the elevation. I also became familiar with the FT897 and found what a great radio it is for this kind of operation. The other radios used were FT817 and a TS2000 which I found to be a very good radio too. The TS2000 has an option to automatically transmit CW at a 700 hz offset (actually the offset equals your selected cw beat note and sidetone frequency) when you switch from USB to CW. It also has an option to automatically switch from SSB to CW mode if you press the key, whether it’s an automatic key or a hand key. Very neat. Apart from the radio aspects it was also great to get to know Michael VK3KH, Alan VK3XPD, Kevin VK4UH. We were fortunate in being well organised on the social and meals front by Michael’s wife Roz and her sister Gail, and Alan’s wife Aileen all of whom made this event that much more enjoyable. We did attend a few local special events such as the fish fry, the progressive dinner and the re-enactment drama based on the voyage of the Bounty, the eventual mutiny led by Fletcher Christian and the exile of the mutineers at Pitcairn Island. This history is a proud aspect of the Norfolk Island culture today. A great event and a fun filled 10 day trip for me. Here is one photo of the EME antenna. Remember it is 12 metres long. There are 19 elements. Click the photo for a larger view. The long “element” in the centre of the boom is just a truss boom – the antenna has vertical and horizontal stabilisation to prevent it flexing and losing gain. For this event I took my usual station on 50 to 1296 MHz, plus my transverter and gridpack for 2403 MHz, Ted VK1BL’s transverter and gridpack for 3400 and Dale VK1DSH’s 10 GHz station (IC202, transverter, dish and tripod). Contacts were made on all these bands. Performance of the station on 1296 MHz was not as good as in previous years. This may be due to conditions, or to a problem with my antenna or my location on Mt Ginini. It is becoming increasingly more difficult to find suitable places where even two required directions are not partly blocked by the trees on that mountain. Some pictures are already on http://www.flickr.com/photos/exposite/sets and I’ll be putting some also onto the vk1da.net photo pages. After lugging all my equipment for 50, 144, 432, 1296, 2400 and 3400 MHz from the car to the north side of the summit at Mt Ginini, it still took several hours to get set up and operational. I finally got on the air on all bands at around 6pm, after making some earlier contacts on 1296, 2400 and 3400 with VK1BL and VK2AES. Later I made contacts were made with VK1BL/p and VK2AES/p on all six bands (3400 only with VK1BL) but conditions and activity from further afield seemed quite poor with only weak signals from a small number of other portable stations. I was running my station from a newly purchased inverter generator. This was not a name brand but an import sold by a Victorian dealer, mostly marketed via Ebay. I was pleased that its noise performance was much better than my previous generator. However at about 9pm on Saturday night, within 20 minutes have having its fuel topped up, it slowly ran down and stopped. All efforts to get it going again were unsuccessful. I SMSd the other local field stations telling them I had a power problem. The next morning I could only pack everything up and go home. What happens to the generator has not been resolved yet. My confidence in this particular unit is zero. I have not been able to restart it, despite following the advice of the dealer and changing the fuel to premium unleaded. I can believe it would run better, but I don’t see why it would simply fail to restart on ordinary unleaded. I did examine the spark plug and found it was fouled considerably. The recoil starter still reveals compression is good so I don’t think the rings have given up. I suspect ignition circuit failure. Fortunately others didn’t have this problem and went on to make more contacts. The contacts with Doug 4OE did not work out too well, with Ted VK1BL making only marginal contacts on 144. Contacts on higher bands were not possible. Conditions were simply too poor.